The legendary nature of the Sebring 12 Hour Grand Prix extends way beyond the drivers and cars that have raced on this most famous of airport courses for over sixty years. During the past six-plus decades the Sebring race has produced a number of stories that over time have gained the status of urban legends. Of those Sebring urban legends the most widely repeated involved the Comstock Ford GT40 that raced there in 1966. During the race a Ford GT40, being driven by Canadian Bob McLean, suffered a mechanical problem and spun off the course at a high rate of speed. In those days most of the obstructions at the track, such as telephone poles and fire hydrants did not have any kind of protection, such as Armco barriers, surrounding them. When McLean’s car hit a telephone pole broadside it did so with such force that the pole was sheared clean off at ground level and left dangling supported only by the overhead wires. The GT40 was fully loaded with fuel from a recent pit stop and immediately burst into flames as it cart wheeled through the air landing on its top. In a blink of an eye it was fully engulfed with the driver trapped inside. A nearby fire truck only had water aboard and just a couple of dry chemical extinguishers which was woefully inadequate for the task at hand. Both driver and car were incinerated. 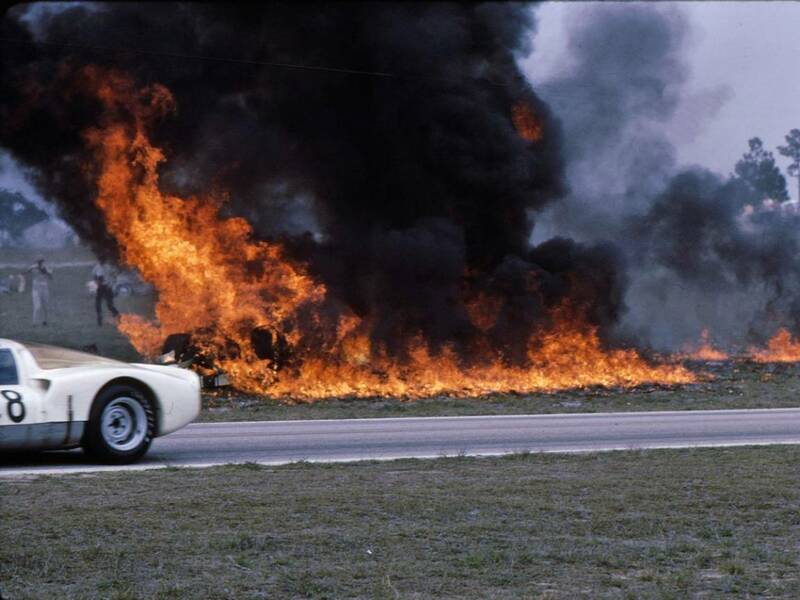 According to legend the remains of the car were buried somewhere on the Sebring course and some fans with, no doubt, overactive imaginations claimed to have seen the ghost of Bob McLean walking the course for several years following the ’66 race. Another legendary story that made the rounds for several years in the mid-to-late 1970’s was the story about a phantom alligator that race fans nicknamed “Big Mo” which was short for “The Monster Gator of Sebring.” According to fan accounts they would awaken from a night of hard partying to find their coolers and boxes of food had been raided the night before and the only evidence of the culprit were a number of large gator tracks leading away from their campsite. For several years Sebring officials attributed these wild tales to too much beer and pranks perpetrated by other race fans. However, the Miami Herald printed a story in March of 1976 about a young lady who was taking her pet beagle for a walk in the spectator paddock very early on race day. She claimed that a large alligator came out of the darkness and attacked her dog. The girl screamed for help and she tried to pull her pet from the jaws of the gator without success. By the time some nearby race fans staggered over to see what was going on all that was left was the dog’s leash and a bloody collar that showed evidence of bite marks. The response of Sebring security was to admonish her for sneaking a prohibited pet into the raceway. Like the story about the ghost of Bob McLean the legend of “Big Mo” would have ended up being one of those scary tales told and retold around campfires in the spectator paddock. 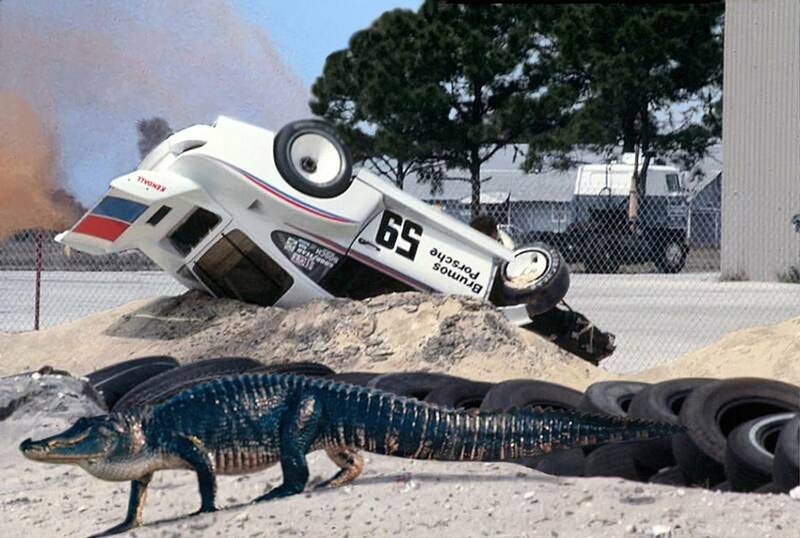 That is until 1978 when this phantom gator made a rare daylight appearance that resulted in a wreck that eliminated one of the favorites at Sebring that year. From 1973 on the name of Peter Gregg was synonymous with Porsche and victory at such events as the Daytona 24 and Sebring. In 1978 Gregg was driving a Brumos Porsche 935 at Sebring and was teamed up with IMSA GT/U champion Brad Frisselle. Gregg started the race in 4th position in his 935 and was making steady progress and on his eleventh lap was about to enter the serpentine part of the track known as the esses. It was at this spot where he would encounter Sebring’s infamous phantom gator. At the same time race photographer Dave Kutz was a bit further down the track but had an excellent view of the cars as they exited the esses. After taking pictures of the start of the race Kutz had hurried over to the esses because he knew that during the early minutes of the race that this was a good spot to get action shots. On his way to his spot for taking pictures Kutz had noticed some race fans on the other side of the spectator fence throwing beer cans and lighted fireworks into the opening of a large concrete drainage culvert. The culvert extended from the spectator side of the track under the fence to an area near the racing surface. After only a few minutes of this a very large alligator came out the track-side culvert opening and began moving swiftly toward the racing surface. The alligator seemed oblivious to the sounds of the race cars passing by and proceeded to cross the track. According to Mr. Kutz, two race cars managed to avoid hitting the gator but as Gregg entered the esses his view of the animal may have been blocked by one of the cars ahead of him. It was apparent when Gregg first became aware of the gator on the track because his Porsche made a violent turn to the right barely missing the creature. Unfortunately the right front wheel of the 935 went off the racing surface catching one of several concrete buttons positioned there. This caused the car to begin spinning in rapid 360 degree circles before hitting a large sand bank head on. The force of the impact stood the car on its nose for several seconds until it tipped over with the top of the car resting on the sand bank. As this was happening the rear wheels of the car continued to spin wildly throwing sand into the air. Mr. Kutz and two corner workers rushed to the accident scene and, as if on cue, stopped dead in their tracks as the uninjured gator crossed their path just ahead of them. It quickly scampered into the opening of another drainage culvert. Kutz had the presence of mind to raise his camera and take a photo before the gator disappeared from view. He found out later that this culvert led to a retention pond about a hundred yards on the other side of the track which may have been the home of the gator. Fortunately Peter Gregg suffered no noticeable injuries from the crash but was transported to the track hospital for observation. His caustic comments about what happened cannot be repeated here. Strangely enough when track officials arrived to investigate the accident they took a very serious tone with Mr. Kutz and the corner workers. It became apparent quite quickly that the Sebring officials didn’t want any mention of an alligator causing the accident that retired a star like Peter Gregg. In not too subtle terms they intimated that if they ever expected to attend another Sebring that they better keep their mouths shut. At that moment Dave Kutz didn’t see how they could keep such a thing quiet. That is until he took a look around him. The place where the accident happened was in an obscure spot where spectators were not allowed. It was also hard to view from the spectator area many yards beyond and on the other side of the track. By the time race fans rushed to the fence to see what had occurred, the gator was gone. Everything had happened in less than 90 seconds. History shows that according to Brumos the official cause of the accident was a failed steering gear. It is possible that when Gregg mentioned to his crew what really happened they didn’t believe him because automotive journalists soon reported rumors coming from the Brumos establishment about Gregg’s failing eyesight as the cause of the accident. Dave Kutz continued to attend Sebring for many years to come but never mentioned to anyone, until recently, what happened that day. Dave noticed that the following year, 1979, the drainage culverts near the esses had heavy duty steel mesh installed on the openings and, as far as he knew, “Big Mo” was never seen again. It’s a good thing “Big Mo” wasn’t around when Phil Currin let his dog run next to his Corvette a few years earlier. Another great Sebring story Lou, keep em coming. That was before Photoshop so I guess we have to believe it 😉 That gator must have gotten into someones beer to go crawling across a hot racetrack. There used to be lots more fun stories like this, but even then the powers-that-be stifled this one. With our increasing commercial sensitivity I wonder what tales of more recent vintage remain to be told. 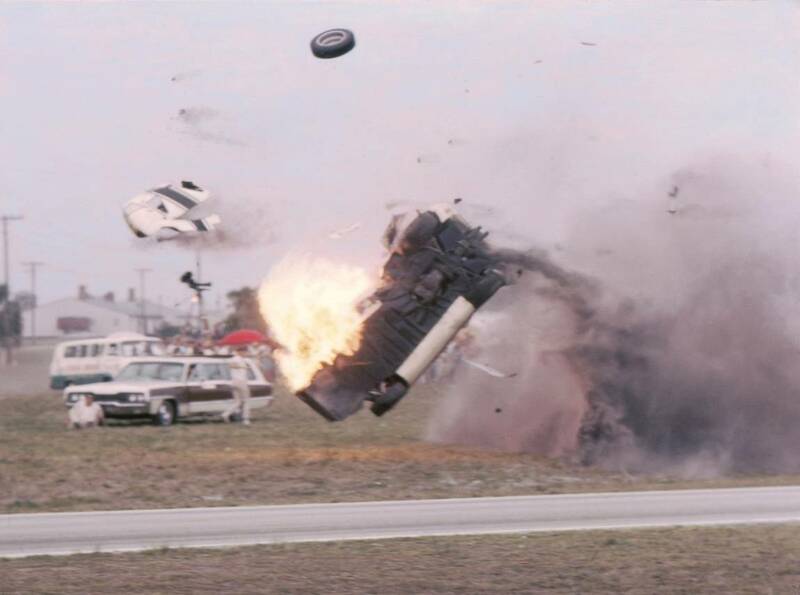 And I do wonder how many people will carp about photos of a racing accident; in ’55 when Vuky was killed at Indy it was in the newsreels at movie theaters through two different feature presentations, about a week. I happen to know the aforementioned Mr Kutz. He was a bit of myth around Sebring Raceway himself. Partly because of the tales he told. More than a myth i think legend would be a better choice of words. April Fool joke – gets ’em going every time. Lou- are you sure you didn’t mess with that picture? I remember the gator as being much bigger than that. Loved the Mo story, Lou! Maybe HSR should stage a reenactment. As they don’t feel obligated to pay their contributers, they could hire a gator to play the menace then, when he/she demands payment, tell him to f**k off (i.e. head back to the swamp). Another great legend from Lou…! HA! You can’t fool me…I know the Porsche was photo-shopped into the image. Mark, take a look at the date the story appeared and you will know if the story was true or not. @ Louis Galanos: I had a feeling that’s what it was but the car on the roof was definitely for real; I was there. I’m amazed to see an image of it pop up on the web being so long ago. Being in Florida, they could save money by hiring an unemployed would-be Disneyworld character impersonator, instead of a real gator. I’ll try to pass this story to Mr. Mario Donnini, endurance enthusiast and Peter Gregg expert (He recently published a feature on him on the Italian weekly Autosprint). Ever hear the story of the Skunk in the Tire wall????? The story’s on it’s way…….involves corner workers, Formula Vee drivers and radiation experiments. George: When I worked the races in the late ’60s and early ’70s we were expected to go to the aid of any driver who was in trouble for any reason. Now, corner workers are restricted to their stations and those safety trucks are supposed to go to the rescue no matter how long it takes. The driver of the Viper took a terribly long time to exit the car probalby due to all the things he was hooked up to. In my day we would have had workers stationed near that spot with big extinguishers at hand. I have personally put out fires just like that with one big extinguisher which I hefted to the car with difficulty. That car could have been saved in my opinion. Typical Lou. Entertaining. I was directly across the track when Gregg did his endo. Funny, it definitely did not cross the track (I’d have surely seen it) and nobody ran from the ‘gator. They must have been on a first-name basis with each other. Do we have to wait until 4-1-15 for more Sebring legends?